Who did laundry work before the Chinese came to the United States and began to open laundries all over the county? Wealthy people had domestic servants who did this laborious work for them. Before slavery ended, in the South many black washerwomen toiled for white masters, with washing and ironing clothes only one of their many chores. 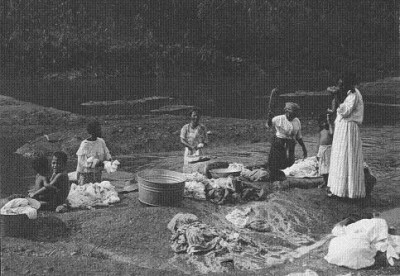 Later, black washerwomen continued doing laundry as a source of income for their families. Many felt they were not adequately paid or fairly treated by whites. 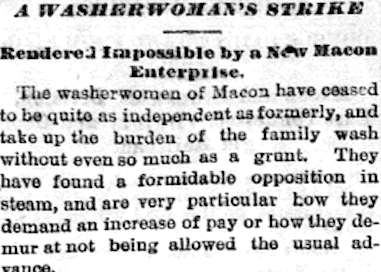 Black washerwomen organized to threaten small strikes as early as 1866 in Jackson, Mississippi, in 1877 in Galveston, Texas, and on a larger scale in 1881 in Atlanta where several thousand black washerwomen protested plans to impose higher license fees. None of these strikes were especially effective in improving their income as whites resorted to counterattacks such as raising rents of black tenants. White steam laundries were too powerful as they were more efficient timewise, as noted in an 1881 Macon newspaper article describing the facilities and operations of a new white-owned steam laundry. 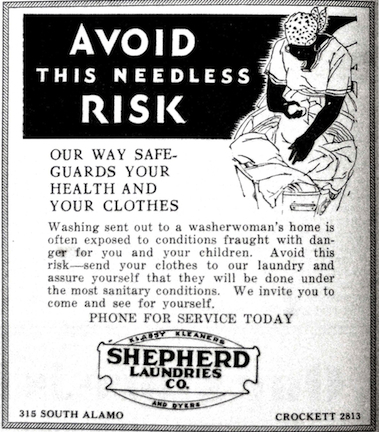 As if having modern washing facilities were not enough to crush the threat of a strike for higher wages by black washerwomen, one steam laundry aroused the fear of disease if clothes were washed by black washerwomen. There was also conflict between blacks and the growing number of Chinese laundrymen by the 1870s. In Galveston, Texas, black washerwomen protested against the Chinese saying they had no business coming here taking work away from us. One woman threatened, “Mr. Slam Sling Chinaman you better sling your shirt short because we mean what we say…” In Lapeer, Michigan, a Chinese laundryman was given three days by black washerwomen to leave town. They threatened to cut off his queue unless he complied. As late as 1899 when a Chinese laundryman showed up in Albany, Georgia, black washerwomen threatened him with death unless he left town. White laundry owners condemned both black and Chinese laundry competitors. 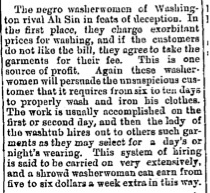 An article in the St. Albans, Vermont, paper in 1872 accused black washerwomen of matching their Chinese rivals in deceptive business practices to increase their profits. 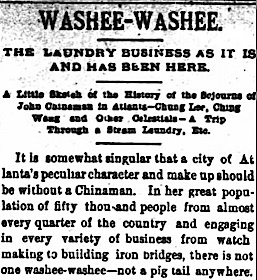 An 1882 Atlanta newspaper article expressed surprise that a city as large as Atlanta had no Chinese laundries left as all the Chinese laundrymen in Atlanta had left the city. A white steam laundry owner suggested that the black washerwomen were too much of a match for the Chinese who could not compete with their low prices. The threats of Black washerwomen toward Chinese did not escalate and were more vocal than physical in nature. Friction lessened perhaps because Chinese laundries concentrated on washing work apparel of men whereas black washerwomen primarily did laundry of women, children, and household items. White steam laundries proved to be a bigger threat to both the black washerwomen and Chinese laundrymen than the latter two were to each other.